The best strategy to follow during the last 3 Months is to Revise and recall a particular topic and simultaneously solve MCQs. Also, make it a point to repeatedly go through most difficult/Tough MCQs. Try to go through the difficult MCQs first and sequentially move towards the least forgotten. You can utilize sticky notes for retaining all the difficult key points, concepts and keywords. Place the sticky notes at a position where they are visible to you majority of the times. Make it a point to revise and go through all the volatile and difficult topics as many times as possible. This will facilitate longer retention. You must thoroughly prepare diagrams of NCERT as a lot of questions in the exam are diagram based ( for Biology ). Ensure that you go through all concepts, keywords and points which are significant from examination perspective. Revise them as much as possible on order to facilitate retention for a longer period. Your aim in the last three months should be to enhance your speed and accuracy as much as possible.In order to improvise your speed and accuracy, solve MCQs as much as possible. Mnemonics serve as a great aid to memorize and retain difficult keywords and points. Use Mnemonics wherever possible to retain important and difficult keywords and concepts. 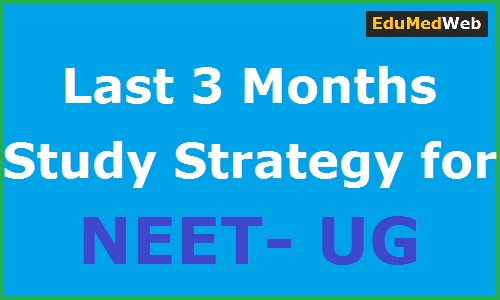 After going through the MCQ books, make it a point to solve and go through the previous year NEET- UG and AIIMS papers. It will not take too much time to solve these papers since theory and explanation part becomes very handy in these papers.